A series of airport projects have been planned by the Indonesian government, following the cancellation of building the third runway of Soekarno-Hatta Airport in Yakarta. Soekarno-Hatta is located near Indonesia's capital city of Jakarta, and is currently handling much more passengers than it was designed for. In order to reduce the burden on Soekarno-Hatta airport, a new airport on the north coast of Java (in Karawang) was planned [3,4,5]. Karawan is one of the main rice production areas on the Java island. Industrial estates have been built in the area since the early 2000s . The new Karawang Airport is part of Indonesia's Master Plan for Acceleration and Expansion of Indonesia's Economic Development (MP3EI). This Master Plan foresees large investments in the country's infrastructure with the bulk of funds expected to originate from private investors. The government is also keen on stimulating public-private partnerships (PPPs) under the wings of the MP3EI program . 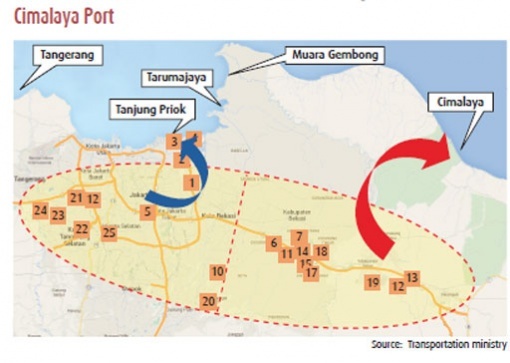 Moreover, in the same region a seaport called Cimalaya was designed to reduce logistics costs in Southeast Asia’s largest economy and to ease traffic at Jakarta’s Tanjung Priok port (which handles about two-thirds of the country's international trade). In December 2011, in this context of planned infrastructure expansion, hundreds of farmers and fisherfolk (members of the Farmers Union of Karawang -Sepetak-) rallied against the proposed port and airport in the Cilamaya district of Karawang. They argued that the local community would be marginalised and refused to accept the spatial plan allocating land for the projects, which would entail the loss of fisheries and thousands of productive rice fields . They rejected the Spatial and Regional Plans (RTRW) Karawang regency in 2012 which provides land for the construction of ports. "We do not need a port, we do not need an airport, we need the care of the central and district governments to prosper us fishermen and farmers," said Sepkist Chairman Engkos Koswara . Both projects, the airport and the seaport are apparently cancelled. The airport project was expected to be operational by 2020, however, Indonesia's Ministry of Transport confirmed the government will no longer pursue development plans for Karawang Airport as the proposed site is part of a conserved forest. Currently, the government is working on finding a new site for the development . Some news still are informing that “the Ministry of Air Transportation is still planning to build the airport and waiting for revision of Regional Spatial Plan to accommodate the plan to build the Karawang Airport”. So apparently the Project is cancelled only temporally . And the Cilamaya plan was dropped, reportedly because it would affect expansion of offshore operations of Pertamina, a state run oil and gas firm, but in March 2016 it was reported that Japan is pursuing a deal for a replacement for the project, a deep sea port further east along the Java northern coast, in Patimban . Indonesia’s Ministry of National Development Planning (BAPPENAS) will conduct a new study - in cooperation with consultants and several other ministries - to determine the new location for the seaport . Some news inform that the seaport can be relocated three kilometers away from the initially proposed location in order to avoid disruption at Pertamina’s oil and gas production block. Another problem that occurred was that the Cilamaya seaport is to be constructed in a farming area and therefore could hamper the central government’s food self-sufficiency program . Project Details The capacity of the airport that would cover 4,000 ha in Karawang would be made ​​similar to that in Soekarno-Hatta Airport . The airport would be built in three phases with an investment scheme based on a public private partnership (PPP). For the first phase, the airport would be built to accommodate 30 million passengers, from a total capacity of 100 million passengers. The government also planned to improve access to the new airport in Karawang, by making supporting infrastructure available, namely the airport train and a toll road . 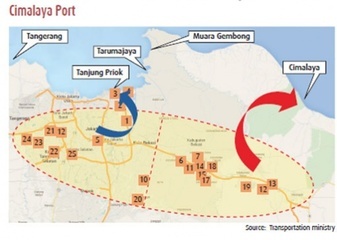 The port area (2,000 ha) would facilitate the movement of goods from and to the industrial estates in Karawang, a large industrial area that houses various estates for the automotive, electronics, machinery and information technology manufacturing sectors . Why? Explain briefly. The Karawang airport project was dropped, but, currently, the government is working on finding a new site for the development. The Cilamaya plan was dropped, reportedly because it would affect expansion of offshore operations of Pertamina, state run oil and gas firm, but in March 2016 it was reported that Japan is pursuing a deal for a replacement for the project, a deep sea port further east along the Java northern coast, in Patimban.